Missy Briggeman is a business and lifestyle coach passionate about helping others change their mindset, change their lives and live their wildest dreams! Missy was an amazing client to work with and so enthusiastic about the design process! We designed a peaceful and sophisticated website to match her brand. 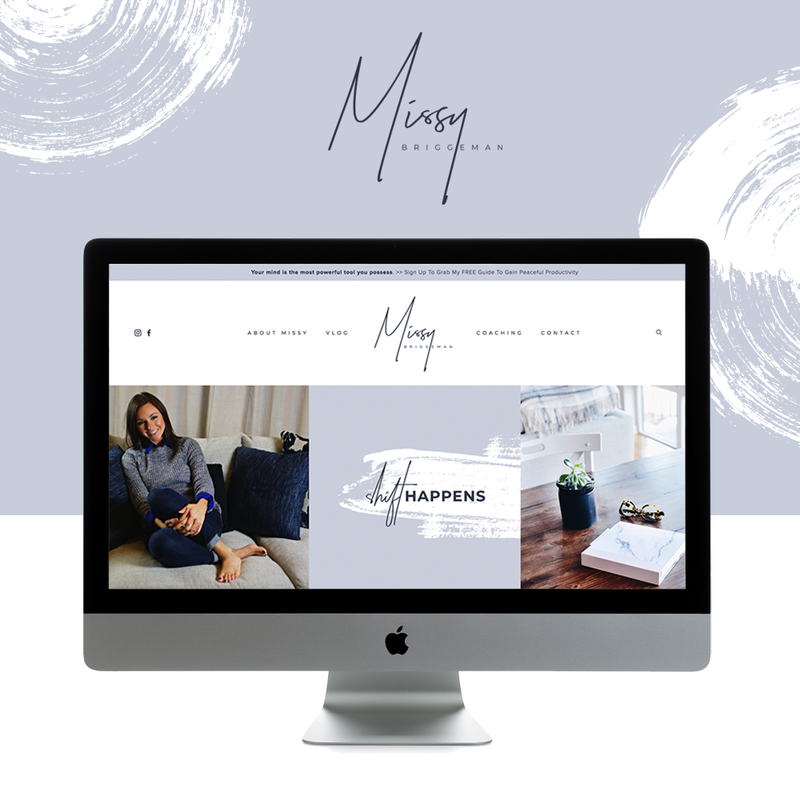 Missy's site is a Restyle of our Always Template, a perfect base for the clean, minimalist look we were going for. The logo was one of our favorite elements of the design and truly captures Missy's essence! "I have gained time and financial freedom and that is all great, but the thing that gets me super excited is helping others, giving and making a difference." Learn how Missy took self-taught skills to start her own thriving business! Missy: The first time I read “Think and Grow Rich" by Napoleon Hill. I started applying the principles, and knew I wanted to share them with others. GO LIVE: DID YOUR EDUCATION HELP PREPARE YOU FOR THE INDUSTRY OR FOR STARTING YOUR BUSINESS? OR ARE YOU SELF-TAUGHT? Missy: Formal education was not my forte. My knowledge has come from hands on experience, school of hard knocks, reading, reading and more reading. Missy: The fear I had of others judging me was really a result of me not loving who I am. Missy: Just make a decision and go with it! It doesn’t matter what others think. Don’t be wishy-washy. Missy: My parents were business owners and I grew up having a vote in the family business. When my husband was fired from his employer, it was a pivotal moment in our lives. We never wanted to be in a position to be voted off the island. So the “big jump” was more like a big shove. We landed on both feet and hit the ground running. I have gained time and financial freedom and that is all great, but the thing that gets me super excited is helping others, giving and making a difference. GO LIVE: WHY DID YOU ULTIMATELY DECIDE TO WORK WITH US FOR A RESTYLE OR CUSTOM DESIGN? Missy: I wanted the best in the industry. Go Live HQ designed the websites that I was drawn to, so it was a no-brainer. Missy: I was intimidated by the thought of building a website. From the moment I signed up with Go Live, I knew I made the right decision. They helped capture the essence of who I am and created the hub of all things Missy!